Saliva is rich in calcium and phosphates, facilitating remineralization of early carious lesions. There is evidence that remineralization is associated with an increase in the size of enamel crystals and a consequent increase in resistance to caries. The contribution of sucrose to the implantation, colonization and metabolic activities of cariogenic bacteria has been clearly established, and has led to the search for sucrose substitutes. Recent report from Australia and the United States of America have reconfirmed the safety and efficacy of fluoride in preventing dental caries. The use of fluoride in various forms thus remains the cornerstone of most caries prevention programme. A representative sample of 817 Tibetan school children aged 7 to 17 years of Mysore district were examined for malocclusion, gingival bleeding and calculus, using plane mouth mirror, sickle explorer and periodontal probes, under natural light. A very slight increase in malocclusion was noted in school girls, in addition to the statistically significant increase in gingival bleeding among 8-13 years and 17 year old girls and 7-10 years and 15-16 year old boys. Moreover, a highly statistically significant increase in calculus was perceived amongst girls. 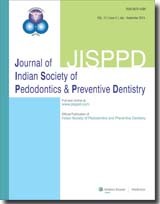 The present study thus showed an increasing demand for preventive and therapeutic dental treatment in these children and early identification of such individuals at risk, can lead to better disease management. A case of cherubism in a 9 year old boy with no familial history is presented. Clinical features, histologic appearance, radiographic findings, differential diagnosis and rationale for treatment is discussed. Enamel consists mainly of inorganic material (96%) and only a small amount of organic substance and water (4%). The inorganic material is similar to apatite. The originally found apatite mineral remains basically unchanged except at the surface in contact with the oral tissues, where diffusion processes operate. Enamel reflects the trace element environment present in the tissue fluids at the time of tissue development. These are variations of types and concentration of inorganic elements found in permanent and deciduous enamel. Variations are also seen in sound and carious enamel. Primary school teachers of Udupi municipal corporation were surveyed to determine their knowledge, attitude and practice toward dental caries and periodontal disease prevention. Fourteen schools were selected by cluster sampling and the teachers working in these schools were included in the sample. The questionnaires were completed by one hundred teachers. The results showed that school dental health services must compulsorily hold demonstrations or lectures on prevention of oral diseases during school feasts and parent teacher meetings, in order to involve the teachers and parents in oral health promotion of the child. A female patient aged 10 years reported with an intra oral swelling on the labial aspect of 32 & 33, appearing to originate from the marginal gingiva & interdental papilla. The swelling was pedunculated, mobile, non-tender, firm in consistency with an irregular surface. The colour of the gingiva was normal with slight ulceration. The swelling was excised & diagnosed histopathologically as peripheral cementifying/ossifying fibroma. Four materials viz. zinc oxide-eugenol, iodoform paste, Kri paste, Maisto's paste and Vitapex (Calcium hydroxide + iodoform) were tested for their antibacterial effect against the aerobic and anerobic bacteria, viz. Staphylococcus aureus, Streptococcus viridans, Streptococcus faecalis, Bacteroides melaninogenicus and mixed bacterial culture; obtained from infected non-vital deciduous anterior teeth. The antimicrobial sensitivity was checked on BHI-agar plates using well method. The results showed that all the 4 materials were distinctly different from each other in their antimicrobial activity. Maisto's paste was invariably the superior most in its antibacterial efficacy (in comparison to all the 5 micro-organism strains). Iodoformized zincoxide eugenol appeared to be the second best followed by Kri paste. Vitapex showed the least antibacterial activity.